The early incarnation of Tinariwen was formed as a collective around campfires in the Saharan desert by young Tuareg musicians on a mission – to promote a way of life for their people to unite in order to preserve their traditions in the face of modern challenges. For many, this was seen as a rebellious act, but as their message spread, demand to hear the group grew, to the point where they would record their music for free at a makeshift studio for anyone who turned up with a blank cassette, to be traded throughout the Sahara. We caught up with Tinariwen bassist Eyadou Ag Leche via email to find out more about the making of new album, Elwan, and how the group began creating their music in the early 1980s. "At the beginning the group was just some friends, Ibrahim Ag Alhabib, Inteyeden Ag Ablil and Keddou Ag Ossad, playing guitars around the campfire, with songs talking about the Tuareg issues at that time," said Ag Leche. "Later on came Mohammed Ag Itlale (aka “Japonais”), Alhassane Ag Touhami and Abdallah Ag Alhousseyni. This was not a ‘band’ in the sense of your definition of a band in Europe. It was an open family of poets and musicians who were performing only for their friends and later on for traditional weddings and parties." Singing in Tamashek the group’s lyrics question their society, their message to the Tuareg people being to face the challenges of the modern world in changing times together, along with recurring themes of homesickness and longing. For more than three decades, Tinariwen have wrought their expansive sound of electric guitar playing their music recognised all over the world as desert blues, though known by the group as "assouf".The hypnotic guitar lines and polyrhythmic backing has a way of sounding very familiar as the long riffs and call and response lyrical themes weave deep musical patterns - a sound they make appear so effortlessly natural, and yet with so many complex twists, it is instantly familiar, as well as timeless. Playing music not just as a way of life, but as a part of life, with you at all times and without it, something is missing. Sounds to fill the emptiness of the surrounding open space of the desert, the music takes you right there. Ag Leche said: "The assouf is the nostalgia. It can be compared to saudade in Brazil or fado in Portugal. This is a feeling of nostalgia about the old days when the Tuareg were a free people of the desert." 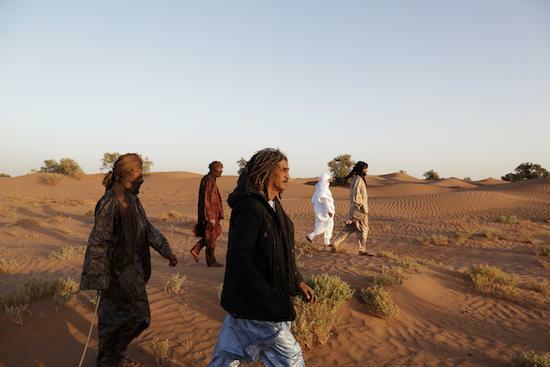 The members of Tinariwen, who’s name roughly translates as ‘The Desert Boys’, grew up in a time when Tuareg people were based across the northern Sahara in west Africa. When west African countries gained independence in the 1960s the nomadic Tuaregs were left without a “home” nation of their own among the newly created borders. A 1962 Tuareg rebellion in Mali against the new government there saw the government retaliate by killing livestock, leaving families with no choice but to move north to Libya and Algeria. Another uprising in 1963 saw many Tuaregs murdered, including the parents of singer and guitarist Ibrahim Ag Alhabib, then aged four. Ag Leche said: "When the French colonies ended in the early 1960s, new borders were drawn all across the Sahara. Our people, the Tuareg, were suddenly living in between several countries with different administrations, and with different rules and taxes. It was very difficult for our people to be accepted by these administrations, who were from a totally different culture. There were then serious droughts in the 1960s and in the 70s. We were shepherds and we suffered from this. People needed to move away to find food for their animals." Having lived through these events, the founding members of the group wrote about the experiences. Ag Leche said: "Our songs talked about this, about our people, our issues and our dream to return to a time when we were free to travel all over the Sahara without borders or control." Shortly after forming the group, members answered a call from then Libyan leader Muammar Al-Gaddafi in 1980 for young Tuareg men living illegally in Libya to receive full military training as part of his plans to form a Saharan regiment in the region. Having received nine months of training then, members of the group were once again called up for military action in 1985 by leaders of a Tuareg rebel movement in Libya, where they met several musicians who became future members of the group. The group has continued to evolve with new members joining over the years, reflecting their influence on a new generation as the group continue to develop their sound with the younger musicians. Ag Leche said: "When Said Ag Ayad (percussionist) and Elaga Ag Hamid (guitars) and I came onboard 15 years ago we brought our own influences. We had listened to music from outside Africa, like reggae, rock and blues, and the young rhythm section became more and more solid and became a strong base for Ibrahim, Alhassane, and Abdallah’s songs." To create the new foundation for the group’s sound, the rhythm players went back to older folk music for inspiration. Ag Leche said: "We only listened to traditional music at this time, like the tinde (a mortar drum), or the imzad (a single-stringed violin played only by Tuareg women), and later on we found some little radios on which we could listen to Algerian stations, which played Arabic music mainly." The group had already begun touring outside of Africa for the first time around the release of The Radio Tisdas Sessions, their first international release album in 2001, ahead of the release of their first album proper Amassakoul in 2003. Ag Leche said: "We were invited to France for a festival by French group Lo’Jo, at the beginning of the 2000s. Then we played at several European festivals. We were the first band from the Sahara to perform in Europe, so the media and the audience were starting to talk about us. Later on artists like Santana, Robert Plant and Bono talked about us too." From the early 2000s the group enjoyed their success at home too, as regulars at the annual Festival Of The Désert in Mali. However, future editions were postponed following conflict in northern Mali in 2012, when the National Movement for the Liberation of Azawad (MNLA) took control of the region as part of an uprising against the central Malian government in a bid to make Azawad an independent homeland for the Tuareg people. While the conflict in Mali is ongoing, Ag Leche said: "We haven’t changed the way we are living. We are just more careful when we are travelling in the bush at night. This is our home and we need to stand up and be proud." Although not all of the group continue to live in Mali. Ag Leche said: "The members of the group who live in Tamanrasset (Algeria) are in exile and the members who remain in Mali stayed home. The north of Mali is really poor and there is no infrastructure to raise our children. We can’t live like before as shepherds, because there is not enough water for the animals. Some of us had to go to the cities and in the cities you need money, schools, hospitals, so some of us went to Algeria. Those who stayed in Mali are trying to help their families and friends, but this is very difficult." At a recent concert at Islington Assembly Hall, in London, the strength of the group’s individual members was demonstrated as their three frontmen, Abdallah Ag Alhousseyni, Alhassane Ag Touhami and Ibrahim Ag Alhabib, also known as Abaraybone, took to the stage individually for different segments of their set. Live, the three main men rarely, if at all, play guitar together, although they do occasionally remain onstage to dance and sing backing vocals. For recent tours Ag Leche’s cousin Iyad Ag Ibrahim, of Imarhan, had been filling in for founder member Ag Alhabib as he had not been able to travel, due to the conflict in Mali. But having rejoined the touring lineup when he joins the stage and picks up his guitar, the audience is taken to another dimension. With his spellbinding guitar playing and instantly recognisable dry voice, even if you cannot understand the words, the melancholy of his delivery conveys his message of his hopes for the Tuareg people. For the making of "Elwan the group swapped one desert for another for recording sessions – by relocating to M’Hamid El Ghizlane, a small oasis town in southern Morocco, and the Joshua Tree desert in California, to work on new material at the Rancho De La Luna studio. Ag Leche said: "Elwan was recorded mostly in the south of Morocco. We did a four day session in Rancho de la Luna and some sessions in Paris. The choice to record in the Moroccan desert was made because this is the best place to make music for us. We feel close to our natural environment and this is where we feel the best to create and record. It is very important for us. Being able to collaborate with Moroccan musicians was also a great experience. The place where we recorded is an oasis close to a small village, M’Hamid El Ghizlane. We were based in a camp in the middle of the dunes. This is the best studio ever." The group also returned to Joshua Tree, where they had recorded their previous album, 2014’s Emmaar, in a private house, and for the new record the group planned to record at the nearby Rancho De La Luna, itself known for producing, among many others, the Desert Sessions series of collaborative albums, described by Queens Of The Stone Age frontman and founder of the Desert Sessions projects Josh Homme as an ongoing mixtape, a vibe that seems to match Tinariwen’s never-ending jam philosophy. Ag Leche said: "When we decided to do some sessions at Rancho it was because Josh Homme wanted to produce some tracks. It didn’t happen in the end, but we kept the studio and invited friends to make music with us, including Kurt Vile, Matt Sweeney and Alain Johannes. We were still in the desert but it was easier to invite some people around. We like meeting artists from other countries, with other styles. It’s difficult to adapt our music to another style, but usually our guests are really respectful of our music. If you didn’t know them you wouldn’t even notice they are there, but they bring something great and discrete to our music." Mark Lanegan later added his haunting “no more sleep walking” vocal line to the track ‘Nànnuflày’. 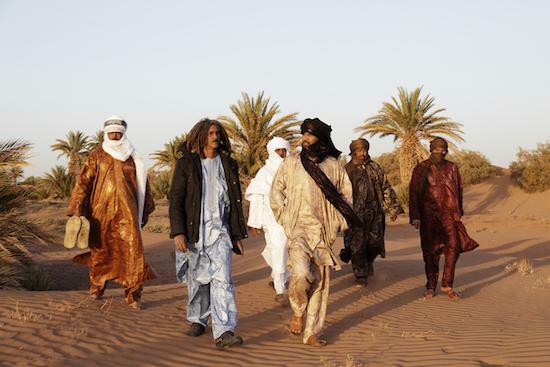 With Tuareg groups from across the Sahara and north Africa now well known around the world, the legacy of Tinariwen’s music is assured to continue. "We know each other, Tartit, Bombino, Imarhan, Terakaft, Tamikrest…we meet most often during our tours around the world." said Ag Leche. The title of the album, Elwan (‘the elephants’), comes from a line in the song ‘Ténéré Taqqal (What Has Become Of The Ténéré)’. Ag Leche said: "It talks about ‘the elephants’ who are destroying everything they come across. This is a metaphor about the big companies, the corrupted politicians, and the extremists. The Sahara is populated by more and more obscure powers and our people and environment have been in between all this chaos for years now." Another song on the album, ‘Assàwt,’ is addressed to Tamashek women still in Mali. "Women are very important in the culture of Tuareg society and a lot of traditional Tuareg music comes from the women, playing the tinde, or the imzad," said Ag Leche. "When the men are away with their cattle the women take care of everything. They are so courageous to stay in the bush with the children, who do not have any help, in schools, with no administration and no hospitals. "With everything happening in the world, in our desert, and in America, we need to stand up and fight - for our freedom and for the respect of our planet."